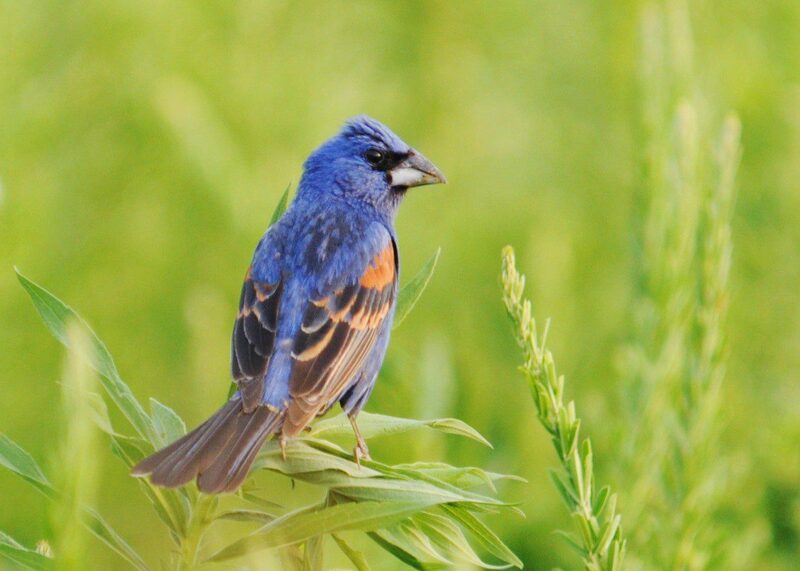 A male Blue Grosbeak in a meadow at Bombay Hook National Wildlife Refuge. Image by Derek Stoner, June 27, 2011. 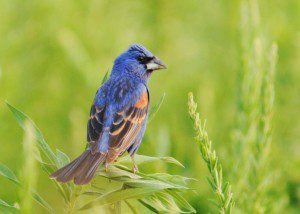 A dashing combination of deep blue with russet wings, the Blue Grosbeak sings from his perch as the last rays of the day’s sunlight play across his brilliant feathers. The camera focuses tightly and the shutter trips dozens of times as this bird sits cooperatively for a portrait session. An Eastern Kingbird perched along the edge of the salt marsh at Bombay Hook National Wildlife Refuge. Image by Derek Stoner, June 27, 2011. 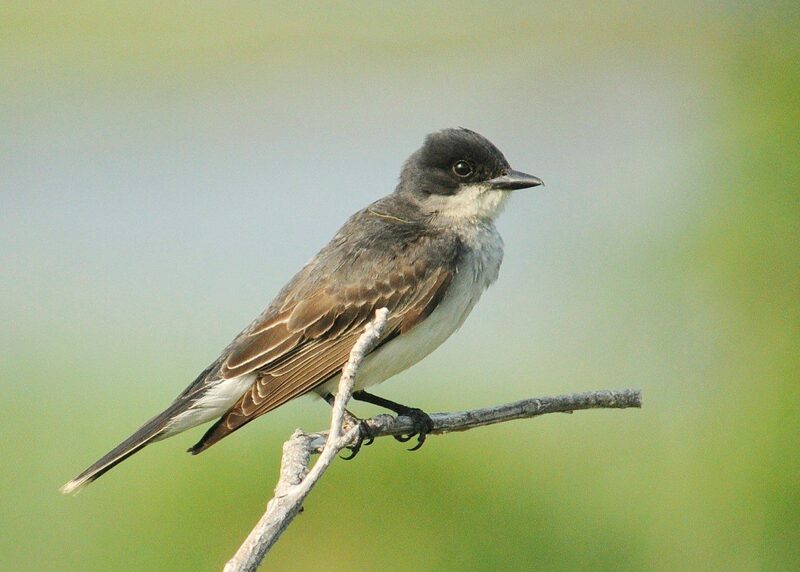 Around the next turn, an Eastern Kingbird perches on dead tree on the edge of the vibrant salt marsh. This black-and-white flycatcher sits motionless for long periods of time, then flies forth on spirited pursuit of flying insects. The local greenhead and deerfly population must take quite a hit from these talented insect assassins. 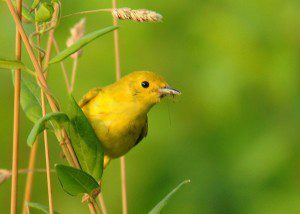 A male Yellow Warbler pauses while bringing a "beakful of bug" to its nearby babies. Image by Derek Stoner, June 27, 2011. A bright flash of yellow signals the arrival of a Yellow Warbler , and this one is clutching a prize in its beak: a long-legged fly of some sort. This insect will provide the necesary protein for a growing baby Yellow Warbler, likely waiting patiently in a nearby nest. Wetland edges are particularly attractive to this bird, so there is never a Yellow Warbler shortage at Bombay Hook in the summer. A Red Fox kit scans the grasses for movement and the promise of a potential meal. Image by Derek Stoner, June 27, 2011. As dusk comes ever closer, orangish-red shadows skirt the edges of tall grasses. 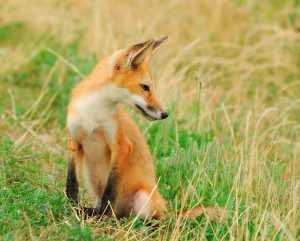 The Red Foxes at the refuge are quite accustomed to the presence of people, and pay no mind to vehicles. 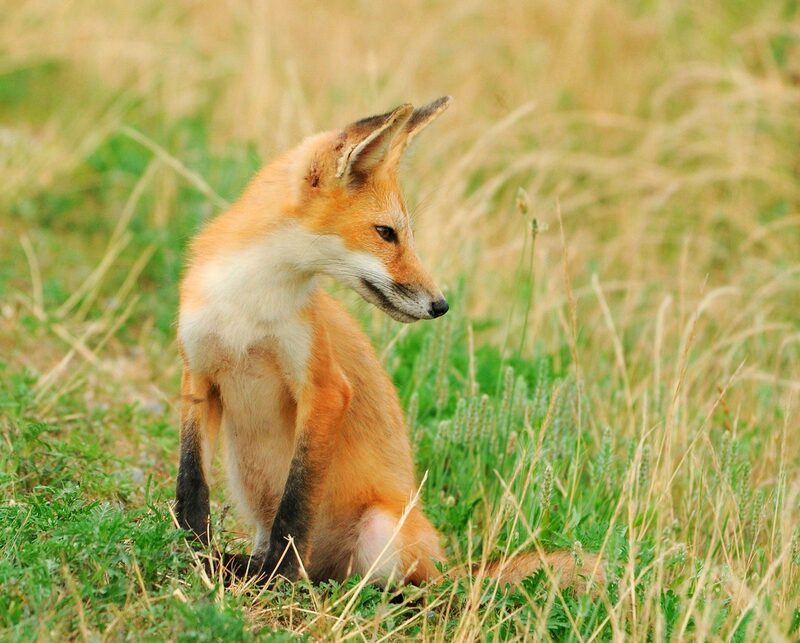 This young fox, likely just a few months old, listens intently as his ears strain for the sounds of prey. His deep brown eyes don’t miss anything, so any rodent within eye-shot is in serious trouble. The fox trots off into the growing darkness and brings a great evening of wildlife watching to a close. Today, July 1, is a special day for our national wildlife refuges. This is the day that the new Federal Migratory Bird Conservation Stamp will go on sale. Better known as the “Duck Stamp” this is the most simple and effective method of taking direct conservation action. Funds raised from sales of stamps go directly towards the purchase of critical wildlife habitat, particularly wetlands. Of Bombay Hook’s 16,000 acres, 94% of the land was purchased with Duck Stamp funds. Buy your Duck Stamp, and get in on the best bargain in conservation. An investment of just $15 gives you year-long admission to over 550 refuges nationwide, and the satisfaction of making a lasting contribution to conservation in our great nation. And when you visit a refuge and see great wildlife, please share your sightings with us! Outdoor Images and Moviemaking: Summer Camp Style! 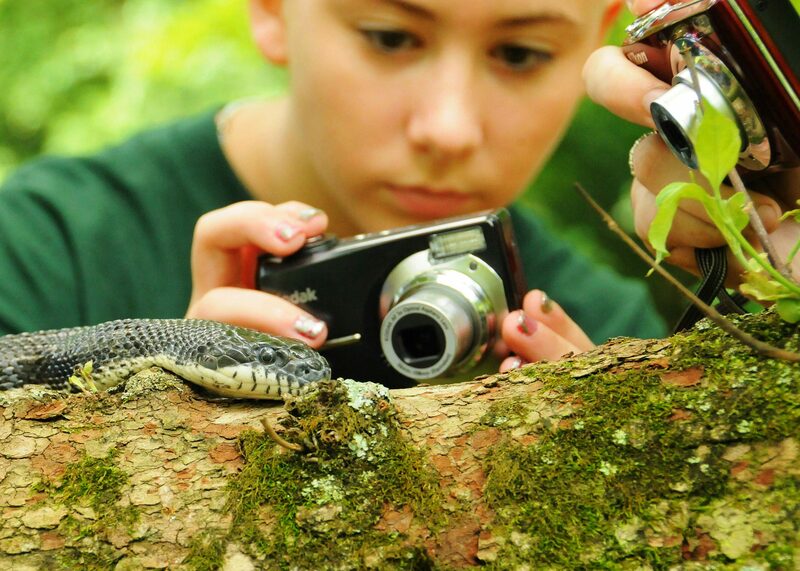 Getting up close and capturing images of nature(like this Black Ratsnake) is what this summer camp is all about! Photo by Derek Stoner, June 13, 2011. To kick of another great season of summer camps offered through the Delaware Nature Society, we held a session of the popular “Outdoor Images and Moviemaking” camp. A talented group of 11-15 year-olds improved their photography skills and discovered a wide variety of native flora and fauna during a wonderful week in the field. The campers documented the diverse sights and sounds with digital cameras and a digital video recorder as we visited local preserves. They observed colorful wildflowers at Coverdale Farm Preserve, a pool full of frogs and tadpoles at Bucktoe Creek Preserve, swarms of herons and egrets at Bombay Hook National Wildlife Refuge, and the aerial antics of hummingbirds at the Ashland Nature Center. You are invited to view the compilation of the best photos and video clips of a week spent outdoors. I’d like to congratulate the campers — Amber, Jessie, Savannah, Ben, Caroline, Josh, James, Melissa, Katie, and Yelena– for making such outstanding images and bringing creative skills to the photography process. Enjoy their show! Rays of sunlight filter through the tree trunks in the forest at Middle Run Natural Area in Newark, Delaware. Image by Derek Stoner, June 23, 2011. 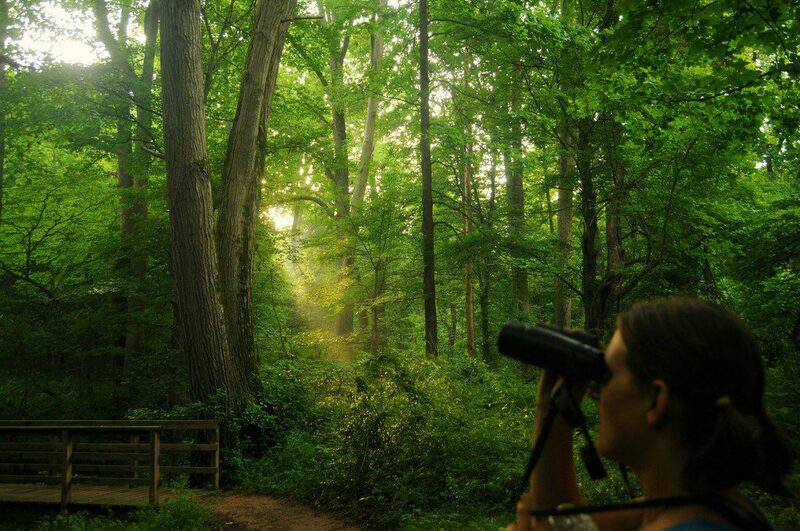 ﻿﻿﻿﻿While walking through the forest at Middle Run Natural Area last night, our group from the Delaware Nature Society’s Evening Walk Series experienced several magical moments that are the good-fortune reward for spending time outdoors. The rainstorms of late afternoon had wiped away the heat and staleness of the atmosphere, leaving a refreshingly cool and fresh air to breathe in as we hiked. The long-hidden sun broke through the clouds and sent rays of light into the forest that looked white in the misty haze of the moisture-laden air. Only after a rainstorm do you witness this effect, and many a movie has featured this phenomenon that adds a magic (and mystical) touch. A Barred Owl perches in a beech tree, as the rays of late evening light filter through the woodland. Image by Derek Stoner, June 23, 2011. As we headed down the trail I caught sight of an odd shape perched on a vine at eye-level. 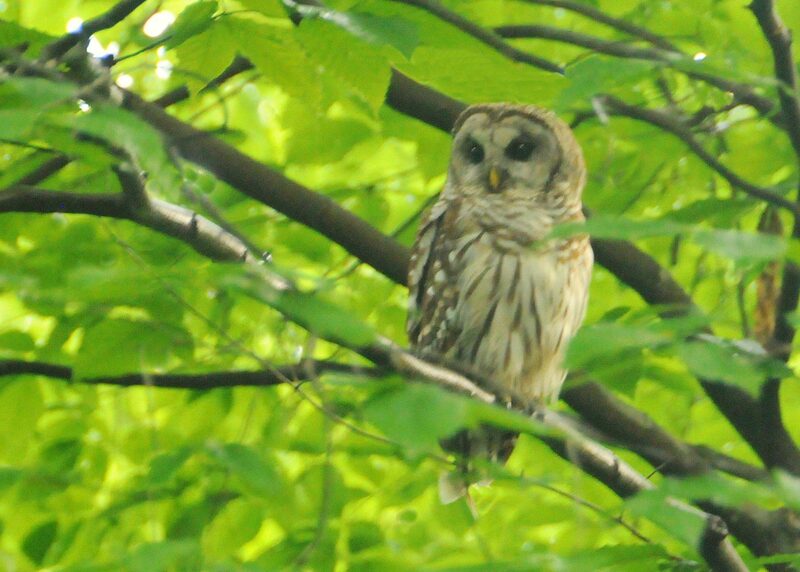 Staring right at us was a Barred Owl, that blue-eyed wonder owl of the wet woodlands. The owl allowed us to approach within twenty feet, as we made our way along the trail. A short flight later, and the owl was now even closer to the path, almost directly overhead. The owl looked at us calmly for a few minutes, then launched off the branch in a shower of rianwater, flying over our heads only to land again a short distance away. The owl seemed intent on hunting, and likely had young owlets still depending upon it to supply them with food. 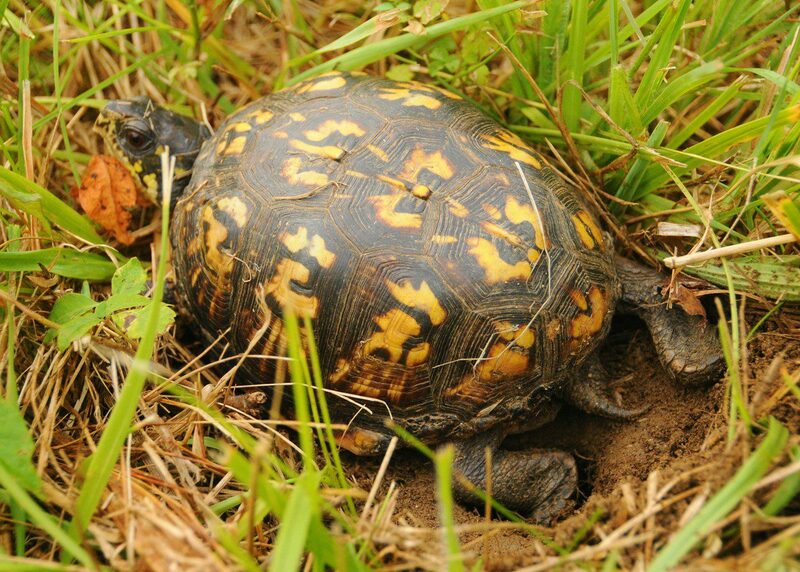 A female Box Turtle laying eggs in the middle of the grassy path of the Middle Run Birding Trail. Photo by Derek Stoner, June 23, 2011. A male Cecropia Moth, on display in the Butterfly House at Ashland. Image by Derek Stoner, June 22, 2011. Right now, there is a newly-emerged Cecropia Moth in the Butterfly House at Ashland. These are huge, spectacular moths (the largest in North America, with a 6-inch wingspan) that are very short-lived. 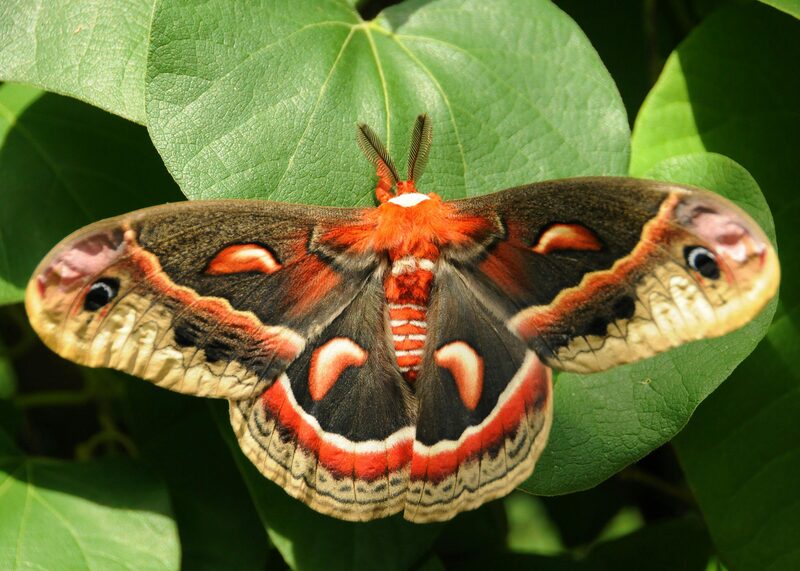 Cecropias belong to the giant silkmoth family, whose members typically only live a few days to a week as adults. Most even lack mouthparts, so they don’t even feed! The Cecropia in the Butterfly House appears to be a male (very lush antennae, fluttering around trying to get out and find a female…), so there is a greater chance of it damaging its wings than if it were a female. Females just hang around emitting pheromones and waiting for a male to come along. So go check it out before it’s too late!